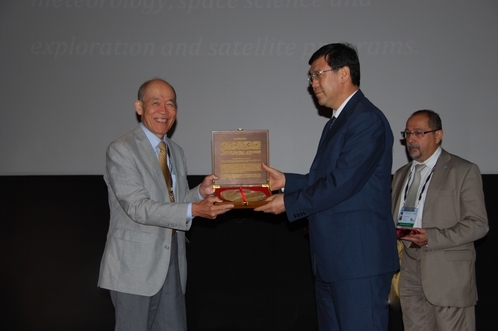 YIN Hejun, Vice President of Chinese Academy of Sciences, attended the 39th COSPAR Assembly in Mysore, India and awarded the CAS/COSPAR Jeoujang Jaw Award to Professor Robert LIN on the opening ceremony on July 16, 2012. Robert LIN has been doing research at the Space Sciences Laboratory at Berkeley. In 1998 he became Director of the Space Sciences Lab. The CAS/COSPAR Jeoujang Jaw Award recognizes scientists who have made distinguished pioneering contributions to promoting space research, establishing new space science research branches and founding new exploration programs. Professor Robert LIN’s work on high resolution imaging and spectroscopy of the solar X-rays and gamma-rays assume pioneering roles, which is in line with the CAS/COSPAR Jeoujang Jaw Award.